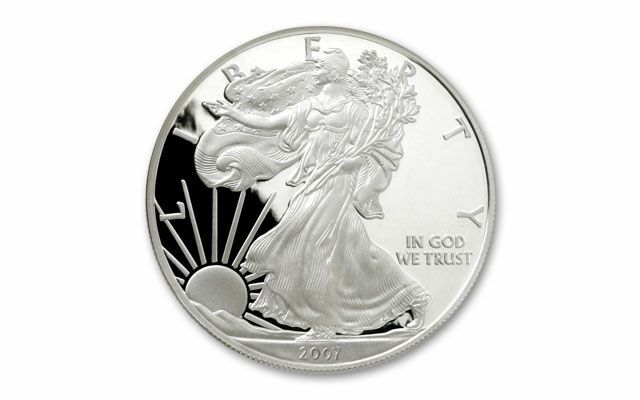 America’s finest silver is displayed in all its glory with the 2007 American Eagle Silver Dollar. Every year savvy buyers stash these away. Each is struck to stunning Proof condition in one ounce of 99.9% fine silver. The price of silver had been steadily increasing since 2004, but a sudden dip and leveling off in 2007 prompted the U.S. Mint to sharply reduce its production of American Silver Eagle coins. Mintages of 2007 Silver Eagle bullion coins were cut by 15 percent compared to 2006, while Proof Silver Eagles saw a reduction of nearly 25 percent. As the global economy slowed, however, the price of silver rose again. 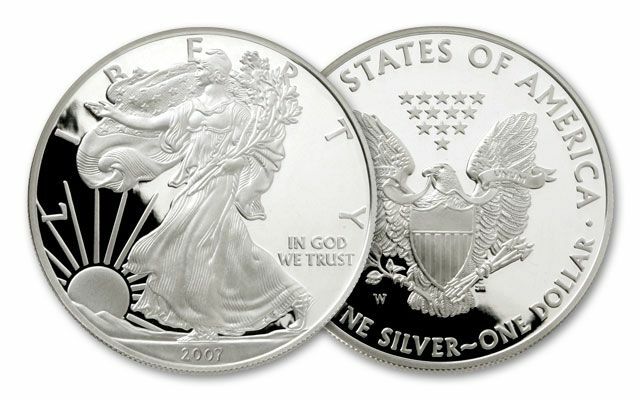 2007 would mark the last year that American Silver Eagle bullion coins were minted in volumes of less than 10 million. 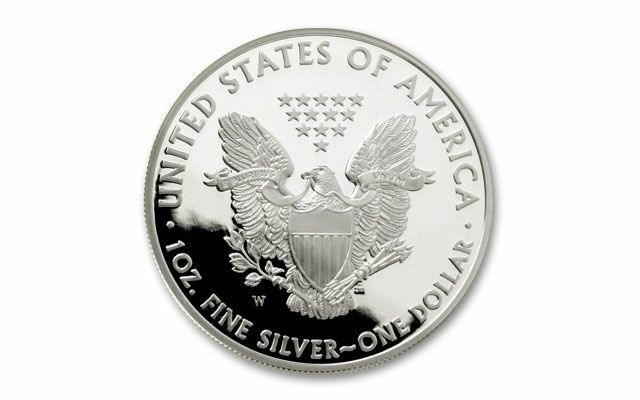 Among 2007 Silver Eagle coins offered by the U.S. Mint were two collectible versions: the 2007 Proof Silver Eagle—a spectacular coin with a highly reflective, mirror-like finish—and the 2007-W Uncirculated Silver Eagle, also known as the "West Point Mint Silver Eagle," struck on a burnished blank and given a "W" mint mark. The 2007 Silver Eagle features an image originally created by American sculptor Adolph A. Weinman for the "Walking Liberty" half dollar, which was minted in the U.S. from 1917 to 1947. The reverse face on the Silver Eagle is based on the Great Seal of the United States and shows a heraldic bald eagle with a shield, sheaf of arrows and an olive branch. The overall average price of silver during 2007 was $13.38 per ounce.